Lyon, April 5th, 2017. At SIdO, the Horizon 2020 programme IoT-European Platforms Initiative, short IoT-EPI, announced a new open call for European startups and SME in Internet of Things powered by the international consortium BIG IoT. Starting on April 26th, the consortia partners will offer expert advice and financial support of up to 300,000 Euro for IoT platform & service providers, who are willing to provide new data to the project through the BIG IoT API and offer the data on the BIG IoT Marketplace. Until December 2018, all IoT-EPI partners in total will grant more than 5.5 million Euro to SMEs, startups as well as university or research projects on Internet of Things (IoT). Meet IoT-EPI at the exposition of the SIdO on booth number 103-200. IoT-EPI was created in 2016 to build a vibrant and sustainable IoT-ecosystem in Europe, maximising the opportunities for IoT platform development, interoperability, data and information sharing. At the core of the initiative are seven research and innovation projects: Inter-IoT, BIG IoT, AGILE, SymbIoTe, TagItSmart!, Vicinity and bIoTope. The BIG IoT project is the fourth project in line after InterIoT, SymbIoTe and TagITsmart, that is announcing a funding call. Currently, BIG IoT has a number of IoT resources from different platforms available in their IoT marketplace. Through the open call, they want to outreach to developers, startups and SMEs in order to grow their ecosystem further. This upcoming open call will be open on the 26th of April 2017 and will run until 16th of June. It will focus on IoT platform & service providers, who are willing to provide new data and services on the BIG IoT Marketplace by implementing the BIG IoT API. Domains of interest are Smart City and mobility. Altogether the BIG IoT consortium will hand out a total amount of 750,000 Euro. With a partner network of 120 organizations (i.e. BMW, Eclipse Foundation Europe, Grand Lyon La Métropole, Libelium, Orange, Unilever, universities and many more), IoT-EPI addresses architectural concepts and concepts for semantic interoperability, which can cover multiple use cases whilst responding to specific requirements in terms of security and dependability. The IoT-EPI projects have a broader reach and address domains like eHealth, Logistics, Retail, Smart Grids, etc. IoT-EPI fosters technology adoption through community and business-building activities, while deriving exploitation strategies, on how to make successful ecosystems emerge, to involve the user in the development process and to respond to the societal challenges for Europe. In 10 open calls, more than 100 external IoT-teams will get tech support and funding ranging from 30,000 EUR to 150,000 EUR each. Altogether more than 5.5 million Euro will be handed out. At SIdO, IoT-EPI focusses on Smart Cities by presenting reference implementations including proof-of-concept, large-scale demonstrations and validation driven by innovative use scenarios. If you are interested in being engaged with IoT-EPI, its projects and the related open calls, come and meet us during the SIdO on the IoT-EPI booth (booth number 103-200)! 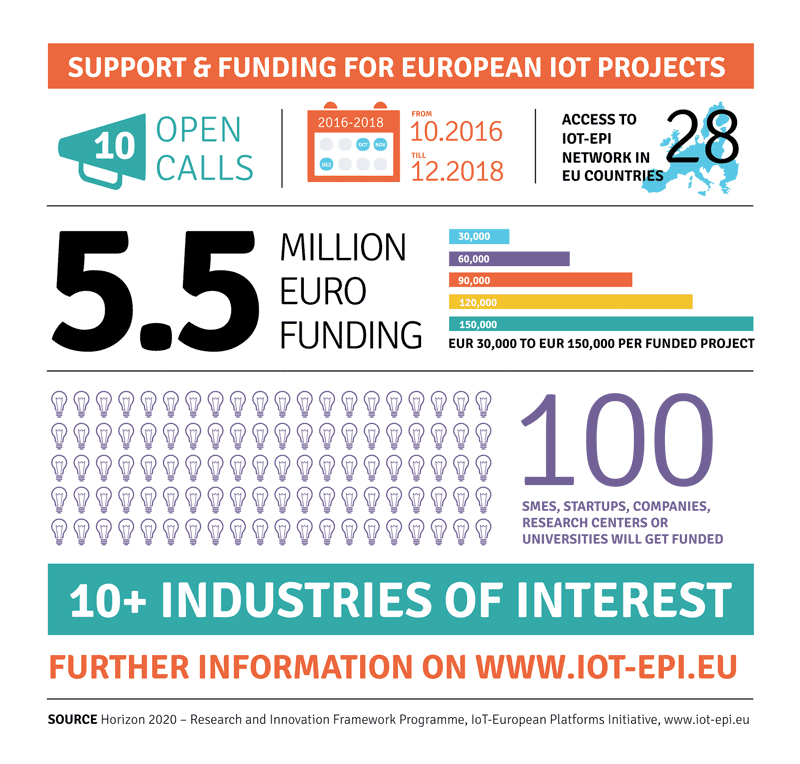 IoT-EPI is a European initiative addressing the new EU-funded H2020 programs about IoT platform development. At the core of IoT-EPI are seven research and innovation projects: Inter-IoT, Big IoT, AGILE, SymbIoTe, TagItSmart!, Vicinity and bIoTope. With a total funding of EUR 50M, and within a time frame of three years (2016-2018), these projects develop innovative platform technologies and foster community and business building based on these technologies. 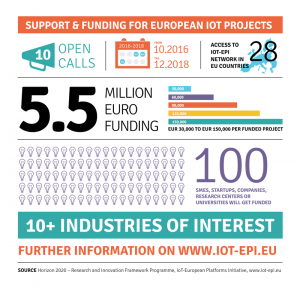 More information about the seven IoT-EPI projects with Open Calls you will find here.